Last week before I went on vacation I was in Love Park in that blistering heat that Philly was suffering through. Kids were playing in the fountain and tons of people were still stopping by the LOVE statue to snap a photo. Here’s a photo of photo taking. Even in the disgusting heat I couldn’t help but be content in my city of brotherly love. When I went to live in Mexico for a year between my sophomore and junior years of college I was advised to take gifts to my host families that represented my culture. I was so glad when I realized I could give them a little replica of the LOVE statue instead of the Liberty Bell. The Liberty Bell was too patriotic even though it was very Philly. Being known for love is pretty cool. I was at Love Park that Thursday at noon because we were creating missional space. We meet in Love Park every Thursday at noon to see if there is anyone we need to meet, and to practice our connecting skills. My friends and I were looking around at those braving the heat and wondering how we might make friends (something I am often doing now). Just then a woman walked into the park who I “knew” from my morning disciplines on Broad Street. A few mornings a week I stand in front of Circle of Hope’s building at 1125 S. Broad Street and I say good morning to those walking up and down the street, and I pray. I had said good morning to this woman for several weeks. She was one of the people who did not ignore me. I asked my friends if that was enough reason to go and talk to her. They said, “What’s the worst that could happen?” I agreed and I went up and talked to her. It turned out we had some mutual acquaintances and she lived around the corner from Circle of Hope’s meeting space. She might be interested in checking out one of our Public Meetings and she gave me some contact information. I was excited by how my two very random exercises, standing on Broad Street and hanging out in Love Park, coalesced and I made a new friend. I see God at work in that. I pray that God continues to work though me both randomly as he did in this instance, and more according to plan as I hone my church planting strategy to focus my efforts. Bohnanza, Smash Up and Pig Pen. Those are the three card games I played on Saturday night at Circle of Hope’s Monthly “2nd Saturday Game Night Extravaganza!!! !” I won in Bohnanza growing rows of beans-green beans were my cash crop. I won in Smash Up too with a group of Zombies and Pirates. I lost in pig pen despite having two buckets of super feed- but 2 out of three ain’t bad. I only played 3 games because I was more interested in helping people connect and meeting new friends (my favorite thing to do). I was amazed at the diversity of people who were there. I was surprised that so many were there at all! Apparently there aren’t a lot of opportunities in the Philly area to play games, especially weird bean farming games like Bohnanza and unpublished indie games like Pig Pen. It was fun to make a space for community to be cultivated. I probably could have thought of something better but I had this sense of urgency that the opportunity needed to be taken. I wanted us to be known. I wanted our new friends to know that we liked board games and we liked them. I had to seize the opportunity to do that. Being a Jesus follower is kind of like these card games I was playing in that it’s often a lot about opportunity. The old adage, “You got to play the cards your dealt,” proves true in these newer card games, and in sharing the truth about Jesus. Having an elaborate long term strategy is a good way to lose, especially if you pass up present opportunities for a better one that only might come. 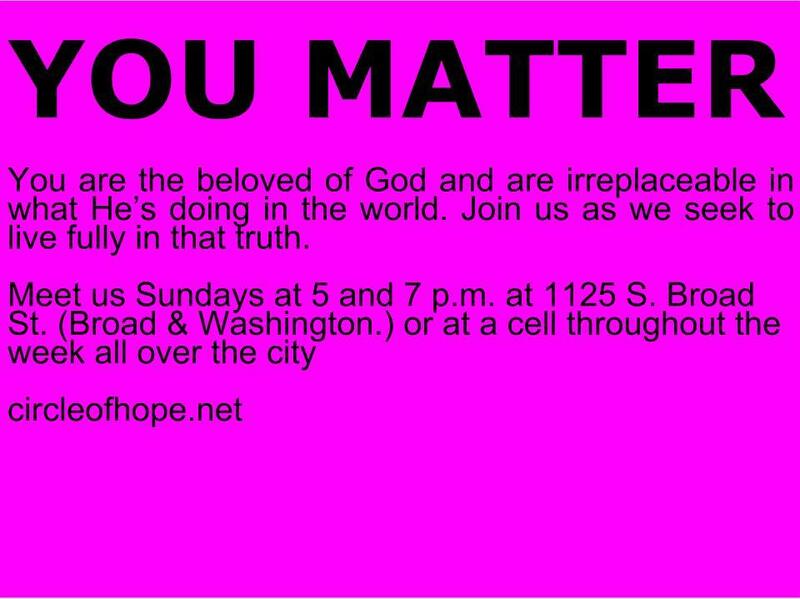 If you’re with 50 people in a Circle of Hope space, it doesn’t matter that much what you say you got to make yourself known and share your joy. So I’ll take another opportunity here on this blog: Jesus brings me great joy. He gives me a purpose that is hard enough to dedicate my life to it, but easy enough in the end to not be afraid to fail. He forgives me and provides me with a reason and a way to forgive others which clears the way for unhesitating connection and real community. He loves me enough down deep to help me be vulnerable in sharing my joy at all. I get excited about that and I want others to take the opportunity He is and receive all these things and more. When you wear a sandwich sign some people will yell across a crowd to you. I learned this and a lot of other things at the Party on the Parkway on July 4th, this past Thursday. The first person to yell across the crowd got my attention by reciting what he had memorized of the Declaration of Independence, “We hold these truths to be self-evident, that all men are created equal, that they are endowed by their Creator with certain unalienable Rights, that among these are Life, Liberty and the pursuit of Happiness.” (My sign asked, “are any truths self evident?”) The reciter, whose name was Anthony, felt a little like he was being quizzed when I asked him, “So what does that mean to you?” I assured him, there wasn’t a right answer and he loosened up a bit. He gave me his email address later because he was interested in what we were doing as a Circle of Hope. Four friends and I decided that since our fair city was throwing a party on the Ben Franklin Parkway and thousands of people were going to be there, we ought to be there too. But how do you engage with people in a crowd? How do you break the wall of isolation between strangers? We thought we’d try a sandwich sign. I made three signs with three questions lifted from the language of the Declaration of Independence. “What is liberty?” “Who is deaf to the voice of Justice?” and “Are any truths self evident?” The back of the sandwich sign said “#declareyourself” (our tweet hashtag that we thought we invented but was already in use by this organization). I got yelled at across the crowd two other times. Once by a group of girls I had met earlier, who yelled my name in celebration when they saw me again. That was fun. The last time was by a woman who applauded our question mark after “liberty.” She went on about how the 4th of July was a sham and we aren’t really free, and neither were the original declarers even after they won the Revolutionary War and certainly not oppressed people of that time. I enthusiastically agreed with her. She was having fun with this. Then I told her we were Circle of Hope, a church that was trying to help people get really free. She let out a sigh of disgust and said, “Nope, I don’t do religion. I’m free from religion too.” I agreed that religious people had done a lot of oppressing but I could not convince her that Circle of Hope might be different. Disappointing as that exchange was, she did confirm why we were there. We needed to put a question mark after a lot of things, most importantly, after the preconceptions people have about the Church. We’re working with a legacy of oppression. She’s not the only one who thinks she needs to be free from religion. I’m working to be the sort of religious person who challenges people’s notions of what it means to follow Jesus, who can be in and who can’t, and what Jesus is really up to in the world. I’m praying that our question marks erode the resistance that is hardening the hearts of many.